I’m putting this top to bed. I like it from some angles and not from others. I might still wear it, or I might cut it up and modify it, but I don’t think I want to make another. The fabric that I’ve used does it no favours. It’s a denim-look cotton shirting with just enough stretch to keep the bound armscye and neckline permanently wrinkled, despite a good pressing. 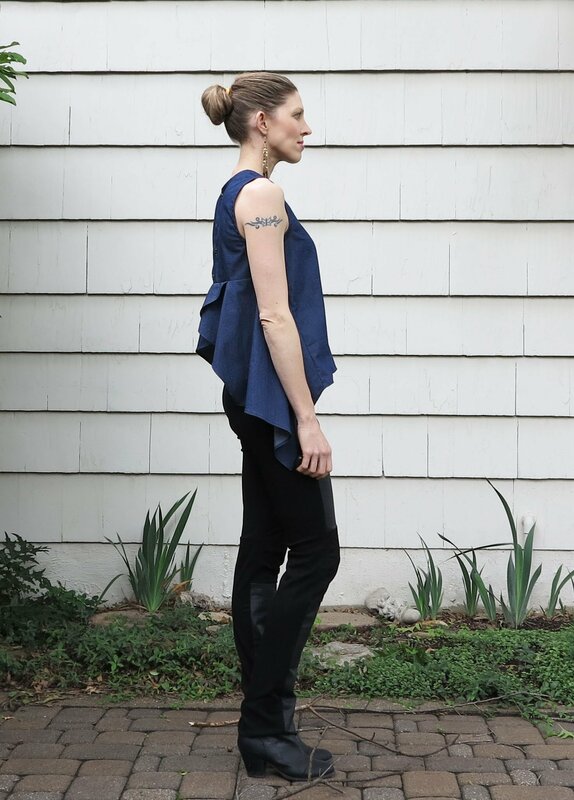 Perhaps I could lower the neckline and change the shape of the front armscye, or add darts, but I’m just not loving it either way. And I need to love it if I’m going to spend any more time on it. Sometimes you just have to let things go. 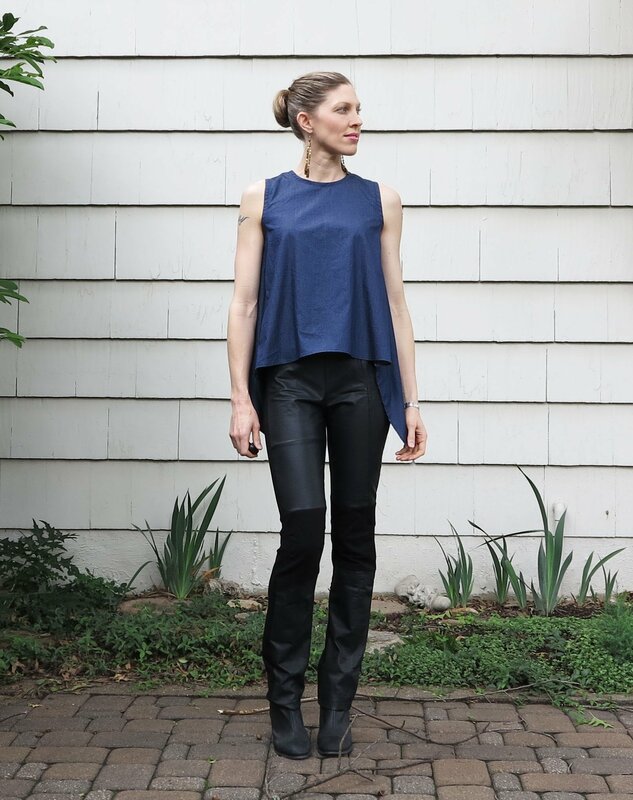 This entry was posted in chambray, cotton, cropped, denim, drape, fabric, faux leather, leggings, pants, patternmaking, peplum, shirting and tagged chambray, cotton, faux leather, leather, leggings, patternmaking, shirting, top on June 8, 2015 by Debbie Iles. I think it’s cute 😉 I understand your letting it go, it seems there would be a narrow range of fabrics that would do both the structured back and the draped front well. Oh my goodness! I LOVE the back. I actually like the front too, but that back is a showstopper. Maybe you would love it if the front was in a more flowy knit? love your ideas, have you gone into clothing pre-production with any of them? Bummer – what am I gonna do for a cute top pattern now? 😉 Absolutely let it go if you are not feeling it. Maybe one day it will rear it’s so-not-ugly head again and you’ll figure it out. Bummer! 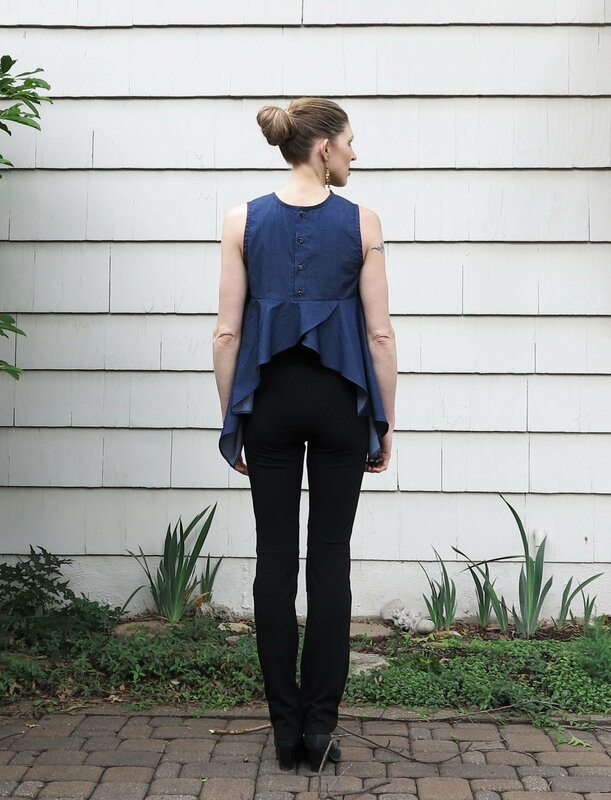 I love the flow of the front and sides but agree trying to find a fabric that will allow for the front drape AND the back structure is going to be tricky. Oh no!! I totally LOVE it! Of course I’m not the one wearing it, but I think this is an absolutely rad outfit. adore the drapey loveliness of this – I hope it gets revisited again! Sometimes we just need to move onto something else. Who knows, you might change your mind in a few months. I love it from the back! What about changing the neckline a bit, either scooping or lowering it a touch? It’s cute ‘as is’ with the black pants and booties though. Just one girl’s opinion….. Thanks Linda! I agree with you. I do like it with this outfit, mainly the back. I’m going to step away for a while and maybe come back another day to work on the front.